Hawai’i’s last Monarch, Queen Lili’uokalani, whose reign ended with the overthrow of the Hawaiian Kingdom in 1893, is fondly remembered in the islands. 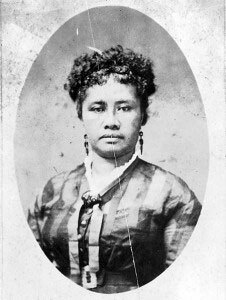 Lili’uokalani led the resistance against the American Government as they sought annexation of Hawai’i to the United States and, because of this, was eventually imprisoned in her own palace for a period of time. “…The honorable Senate of the United States…”??? That, my friends, is composure. More well known to the general public and ‘ukulele players is that the Queen wrote one of the most famous songs to ever come out of Hawai’i – Aloha ‘Oe. It’s a fabulous piece that is just one of many. She wrote enough songs during her life to fill a whole (large) songbook. One of my students requested Aloha ‘Oe for ‘ukulele a few weeks ago and I was more than happy to sit down and pick the tune apart. I created a simple solo arrangement in the key of A which fits the melody well on the ‘ukulele. There is nothing quite like picking through a beautifully simple song.